PARIS — A French artist who has spent three weeks sitting on 10 eggs hatched his first chick on Tuesday. 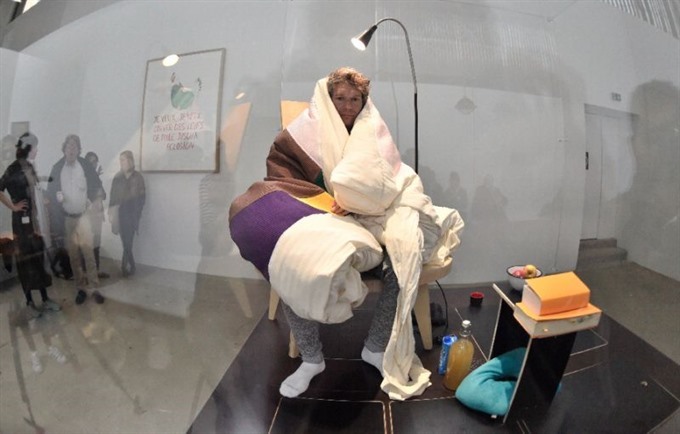 Abraham Poincheval – who made headlines last month after spending a week entombed inside an egg-shaped rock – has hardly slept since he stepped inside a glass vitrine in a Paris modern art museum to sit on the eggs on March 29. Up until then Poincheval was only allowed a half-hour break every 24 hours to keep him from cracking – although he never once left the glass case in the Palais de Tokyo. "It has been really tough for him. He has slept sitting on the eggs. It’s been a lot harder than being shut inside the rock," said a spokeswoman for the museum. What is more the 44-year-old has had to contend with the heat, having to keep the eggs at a minimum of 37 degrees Celsius. He has also been all but cut off from the outside world. "His voice is quite muffled through the glass", the spokeswoman added. "It is quite frustrating to communicate sometimes." From the start, Poincheval – dubbed France’s most extreme artist – appeared far more daunted by the performance than his claustrophobia-defying spell inside the rock. Now bearded, he could be seen checking on the eggs every few minutes on the museum’s live YouTube feed and talking with museum staff. "The chicks will stay with Abraham inside the vitrine for 72 hours," the museum’s spokeswoman said. His father Christian had earlier said that as a child Poincheval had a pet chicken. In Toine, a bad-tempered farmer’s wife gets revenge on her idle bon vivant husband by using his body to keep her chickens’ eggs warm when he is paralysed by a mysterious malady. He once spent a fortnight inside a stuffed bear eating worms and insects, was buried under a rock for eight days and navigated France’s Rhone river inside a giant corked bottle.